For over 20 years, Arizona Athletics has recognized excellence in education by recognizing outstanding high school teachers in Southern Arizona. The University of Arizona Online has joined this initiative and is the proud sponsor for the Arizona Online High School Teacher of the Year awards program. Each year a committee selects nine high school teachers as finalists and they are acknowledged with a presentation at a home men’s basketball game with the winner being announced at the end of the season at and awards banquet. 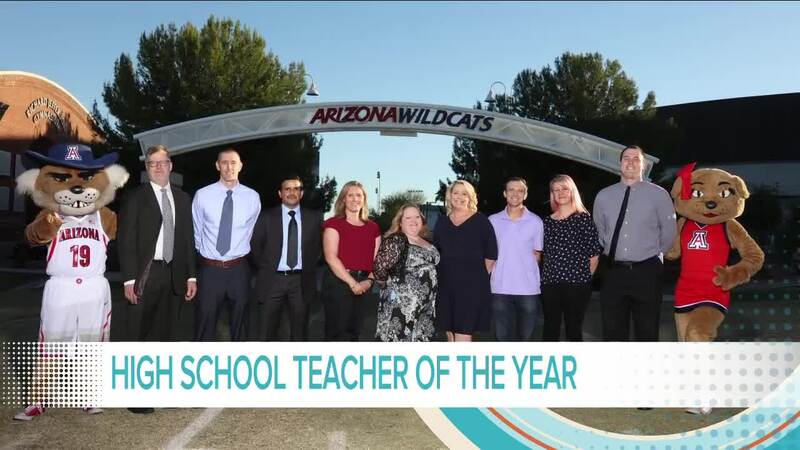 Arizona Online is excited to recognize these outstanding teachers and increased the award money the teachers will receive. Finalists will each receive $500 (previously finalists didn’t receive a cash award) and Arizona Online has also increased the winner’s prize money from $1,000 to now $2,500! The partnership between business, higher education and public education is an important way to recognize teacher for their outstanding efforts on behalf of students. For over 20 years, Arizona Athletics has recognized excellence in education by recognizing outstanding high school teachers in Southern Arizona. The University of Arizona Online has joined this initiative and is the proud sponsor for the Arizona Online High School Teacher of the Year awards program. Each year a committee selects nine high school teachers as finalists and they are acknowledged with a presentation at a home men’s basketball game with the winner being announced at the end of the season at and awards banquet. Arizona Online is excited to recognize these outstanding teachers and increased the award money the teachers will receive. Finalists will each receive $500 (previously finalists didn’t receive a cash award) and Arizona Online has also increased the winner’s prize money from $1,000 to now $2,500! We believe that the partnership between business, higher education and public education is an important way to recognize teacher for their outstanding efforts on behalf of students.